Photo: A young girl stands in a group of children singing a worship song. The children are all miming the action of shielding their eyes from the sun as they look into the distance. 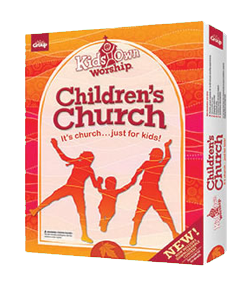 KidsOwn Worship® helps you create a fun and powerful children’s church experience. 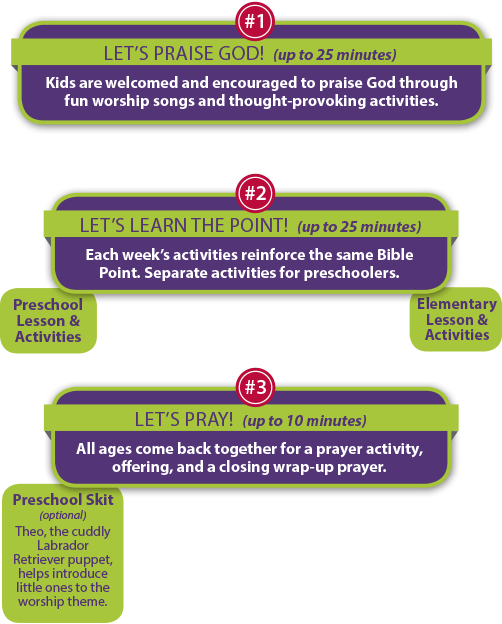 It’s perfect for churches that have everyone together (preschool – 6th grade) in one room. You’ll also enjoy flexible options to fit varying times, group sizes, and age levels. With KidsOwn Worship, you’ll help kids learn to experience God through a weekly Bible Point, fun activities, and engaging worship. 3 Photos from left to right: A young girl sits in a group of children holding her hands in the shape of a heart as she sings along with a worship song. A group of boys and girls of different ages stand close together with their arms raised as they praise God. Two small boys pat one another on the back ina gesture of friendship. Photo: A young girl sits in a group of children holding her hands in the shape of a heart as she sings along with a worship song. Any number of kids, any amount of time—it works! Whether you’ve got five kids or five hundred, KidsOwn Worship fits your children’s church program. You’ll be ready to lead an engaging time of worship no matter how many kids show up. Prayer, praise and worship all tie into the weekly Bible passage. Creative lessons and crafts keep kids engaged, and music teaches Scripture—all with life-changing results. Even if you can’t carry a tune, you can still lead kids in praise and worship. Friendly options such as Sing & Praise DVDs make praise and worship feasible for anyone—regardless of musical ability. KidsOwn Worship children’s church follows the same 3-year scope and sequence as FaithWeaver NOW® Sunday school and FaithWeaver Friends® outreach program. Churches that use these together will reinforce the same weekly Bible passage in a fun new way! KidsOwn Worship can also be used independently for a powerful children’s church experience. Preschoolers and elementary children in harmony in the same room? Kids praising God in their own way? Lessons kids actually remember? KidsOwn Worship does all this and more. 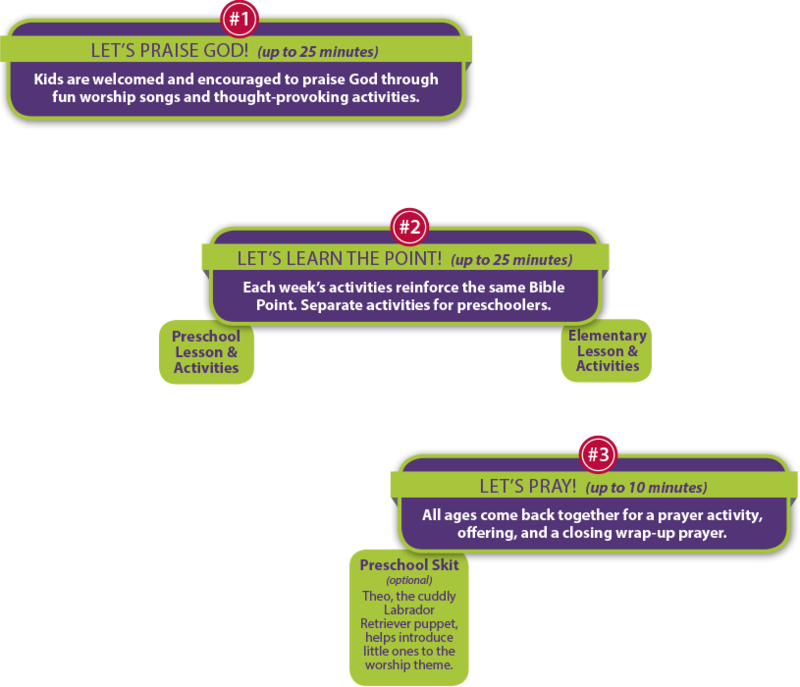 KidsOwn Worship lesson chart showing the step-by-step flow of a KidsOwn Worship Sunday School session: #1 Let’s Praise God! (up to 25 min): Kids are welcomed and encouraged to praise God through fun worship songs and thought-provoking activities. #2 Let’s Learn the Point! (up to 25 min): Each week’s activities reinforce the same Bible Point. Separate activities for preschoolers. Different sets of lessons and activities are provided for Preschool and Elementary age groups. #3 Let’s Pray! (up to 10 min): All ages come back together for a prayer activity, offering, and a closing wrap-up prayer. Optional Preschool Skit: Theo, the cuddly Labrador Retriever puppet, helps introduce little ones to the worship theme. 2 Photos from left to right: A young boy raises his arms in praise along with a worship song. There are several children in the backgound performing the same action. A teenaged girl and a senior adult place their hands against one another's as part of a large group activity. Photo: A young boy raises his arms in praise along with a worship song. There are several children in the backgound performing the same action. It’s simple: Kids praise God. Kids learn the Bible Point. And kids pray. Every week. All you need is one quarterly kit and you’re all ready to help children grow closer to Jesus. Stretch your ministry budget even further with this all-in-one kit that includes a ton of worship and Bible-learning activity options. Anyone can lead meaningful praise and worship and engaging lessons with an easy-to-use, all-in-one DVD! Includes music videos and quick lesson videos that teach big lessons. If you use presenatation software during worship, order a USB drive containing .MOV files! Easily drop files into ProPresenter, MediaShout, or your favorite presentation software. If you prefer audio worship, audio files are available for download through the Digital Download Cetner when you purchase a KidsOwn Worship Kit! Each lesson includes age-appropriate options for your preschoolers. Your little ones will love interacting with Theo the FaithRetriever puppet (sold separately) during the weekly puppet skit. 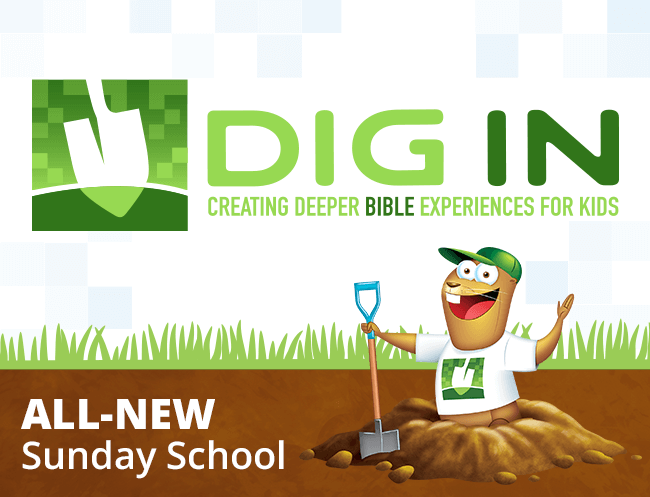 You’ll cement Bible learning through interactive activities and fun gizmos. Kids will stay engaged as they experience each lesson in a hands-on way. Photo: A woman smiles as she sits using her laptop. Quickly email documents to teachers or substitutes. Give teachers and volunteers direct access to lesson content. View lessons on your phone or tablet. You get free access to downloadable content with the purchase of your quarterly kit. 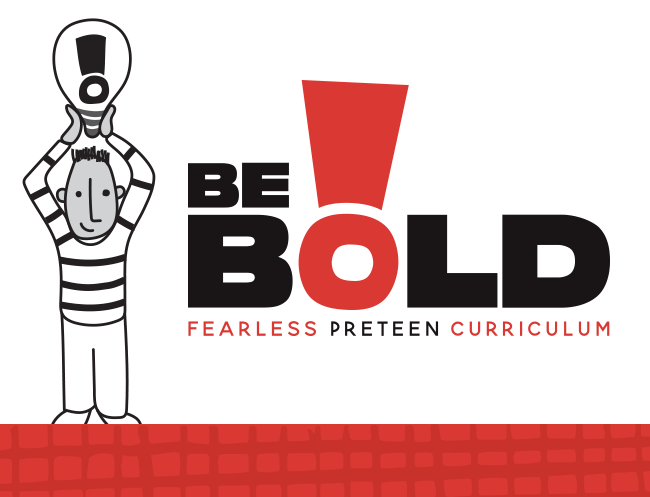 Lead worship with kid-friendly music videos that feature on-screen lyrics and motions, then use discussion-starter videos to engage kids in the weekly lesson topic. Each quarter, the KidsOwn Worship Sing & Praise DVD gives you a variety of memorable tunes to lead kids into worship and help them hide God’s Word in their hearts. The DVD includes on-screen lyrics. You’ll find even more great music on the Songs from FaithWeaver CD-ROM. Pop this disc into your computer to access PowerPoint presentation slides and printable lyrics. 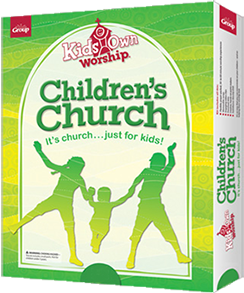 Each KidsOwn Worship kit includes a Skits & Drama DVD with 2- to 5-minute interactive segments that engage kids’ imagination and spark conversations about the weekly Bible topic. Deeper Bible learning with FaithWeaver companion programs. You can provide even more impact when you use KidsOwn Worship alongside Group’s FaithWeaver NOW Sunday school and FaithWeaver Friends outreach program. All three follow the same scope and sequence. 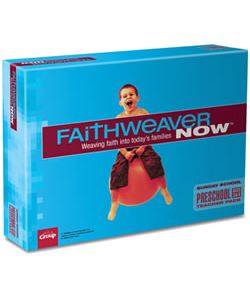 The scope and sequence for FaithWeaver NOW matches perfectly with KidsOwn Worship children’s church and the FaithWeaver Friends outreach program. It’s simple: Kids praise God. Kids learn the Bible Point. And kids pray. Every week. Whether you have five kids or five hundred, KidsOwn Worship fits your kids’ church program. Kids grow closer to God through weekly Bible Points while they grow in their faith through friendships, apply biblical learning through outreach and service opportunities, and make their faith their own through journaling. Choosing KidsOwn Worship is Easy! KidsOwn Worship also includes a free editable digital version of every teacher guide with each purchase. Microsoft Word and PDF versions are provided in an easy-to-use online tool—making it easy to customize your lessons and email them to your teachers each week. 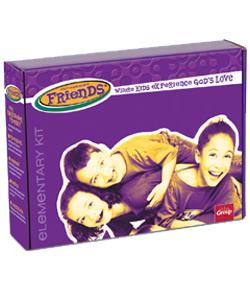 The all-in-one KidsOwn Worship Kit makes it a snap to lead a fun and faith-filled children’s church program. Each quarterly kit includes 13 engaging, flexible sessions for both preschool and elementary kids—all the music, video, and interactive teaching tools you’ll need. Additional Leader Guides, music CDs, and DVDs are also available.